It was an exciting night in B1! The room was packed to see Peter "Madcat" Ruth play and talk about his career. Inspired in 1964 by Sonny Terry, his life in music winds through one incredible story after another. It was great fun hearing him describe his three harp lessons with Big Walter Horton - admittedly a very different teaching style from Joe, but Madcat learned a lot from Horton, particularly a strong appreciation for hand technique. Madcat played for years with the Brubeck brothers, learning melodies, harmonies in a horn section and how to play unusual time signatures. Living in Ann Arbor also put him close to a strong folk music scene, so Madcat has played it all! 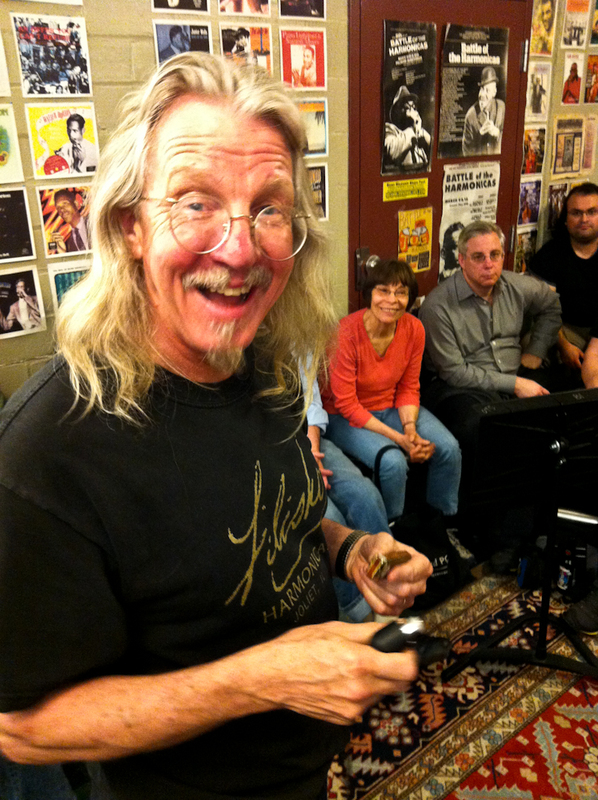 As he says, "If you want to make a living playing the harmonica, it is good to be versatile." In addition to the storytelling, Madcat also demonstrated a lot of his playing techniques - how he uses his hands, how he creates that driving rhythm and he even poked fun at himself to show his musical growth over time. He ripped off 24 bars of lightening fast licks and phrases that he says is the way he "used to play". With maturity he knows now it is more musical and compelling to milk a long swooping note or even leave space and when he demonstrated that, it was clear to all how powerful that is! Get over to the Shaker Microphone website to get one of Madcat's custom-designed harp mics. Thanks for coming, Madcat, it was a terrific night! Yes, there was a lot of great harp playing at our 18th recital Saturday night, but the newly formed Queen B1s may have stolen the show - the trio of female backup vocalists Linda Gordon, Ginny Morin and Barb Selvaggio did some terrific singing and stepped up the professionalism of the whole evening! Joe was thrilled with the recital performances - things went smoothly, space between songs was fairly tight and performances were terrific and inspiring! Joe is especially glad to see so much collaboration going on among both harp players and vocalists. "In two years I'm going to be 80 years old and Saturday was one of the best days of my life!" One of our buddies Ricky Bush is a blues blogger at Back In the Day and he has just released a murder mystery called River Bottom Blues. The protagonists are blues harp musicians looking for the killers of another blues harp musician. Sounds like a must-read! Learn more and order here: River Bottom Blues. Gary Primich - Just A Little Bit More!! !